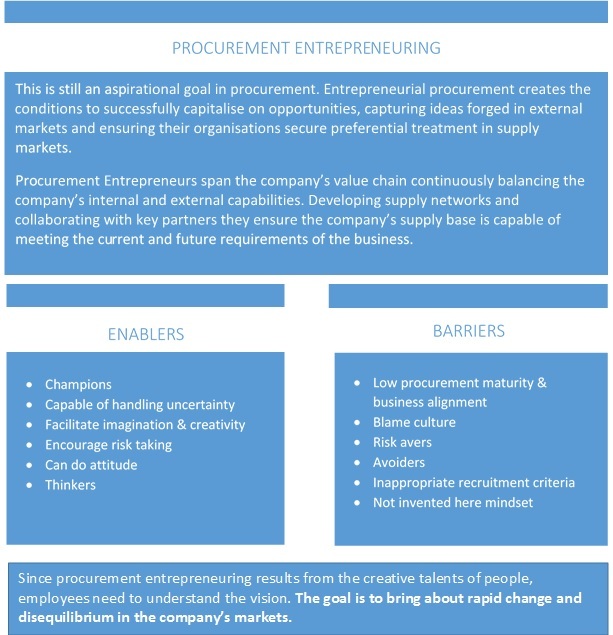 The Brave CPO: Creating Procurement Entrepreneurs – A guide for CEO’s, CFO’s and CPO’s on how their procurement organisation can develop an entrepreneurial role and capabilities to capture innovation and support of growth. This metaphor suggests that it is at the time of buying when you set yourself up for future profits and recognises that the profit potential you control is 100% related to your buying decision. From the very beginnings of commerce, the process of buying and selling has been at its core. Somewhere along the way as businesses focused on manufacturing their products, procurement was relegated to the status of the ‘forgotten function’, and fragmented across the entire spectrum of user-budget holders. This fragmentation resulted in a lack of specialisation and as a consequence, organisational knowledge and capability in procurement was severely compromised. Now as we move out of this historical shadow and into the corporate limelight, procurement is returning to the status of a core business competency and is in need of a clear view of its future. To me, this means developing a more entrepreneurial approach and capabilities. Inside every corporate cynic who thinks “this company is too big to innovate” is an idealist who would like to see it happen. Good people in big companies are tired of being ignored, forgotten, humiliated, and forced into submission. They may be trampled, but they are not dead. When you show them that youʼre driving a stake in the heart of the status quo, you will attract support and resources. Then your goal is to advance these people from wanting to see innovation happen to help you make it happen. Leading on innovation requires employee’s who have the entrepreneurial qualities of business acumen, drive, creativity, vision and ambition to generate ideas, grasp opportunities and challenge the status-quo. 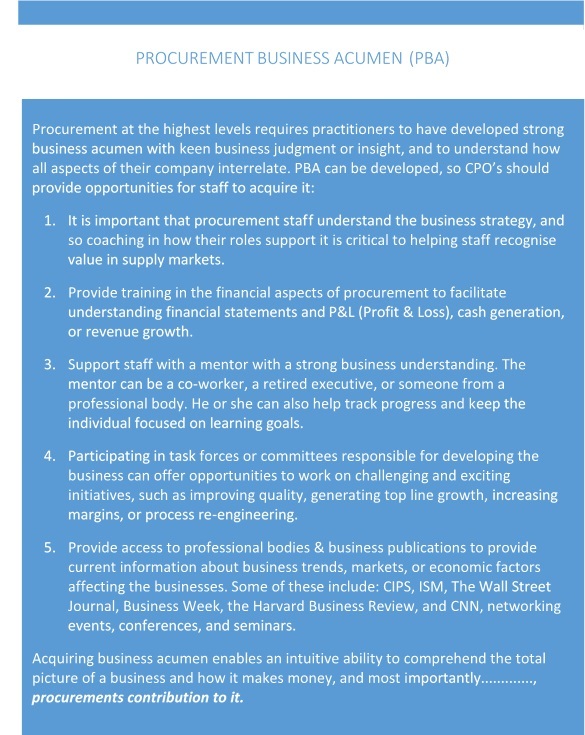 They can be developed, recruited or introduced by external consultants to help establish a more entrepreneurial culture within the procurement function. Often, the very presence of such a person serves as a catalyst for more entrepreneurial behaviour from existing employees. The procurement entrepreneurʼs primary motivation should first and foremost be enhancing the performance of the the company. Unlike their external counterparts, they are not about getting attention, building an empire, or planning their exit from the company. The procurement entrepreneur wishes to retain the comforts of corporate life. They are not seeking maximum attention to attract funds but want to be left alone until either their project has progressed too far to ignore, or the rest of the company realizes that itʼs needed. The Entrepreuring Process is not the same as the Innovation Process. The two need to be separated because procurement entrepreneuring is the process focused on bringing about innovation in an organization. Building the capacity and capability to innovate, both internally and external to the organization. At the tactical level, it means examining business needs and developing sophisticated stakeholder strategies. Structural changes are the entrepreneur’s friend. Whether caused by external factors such as competitive changes in the marketplace or internal factors such as a new CEO, change may create an opportunity for your ideas to take hold. Eﬀective procurement entrepreneurs anticipate changes and are ready to promote their ideas when they occur. This is why procurement professionals are able to delivery year upon year savings, and drive continuous improvement. The procurement entrepreneur is therefore constantly scanning the landscape to be anticipate and respond to technological changes and market shifts. When you have an idea for a product, service or a new way of doing things, it will attract both supports and detractors, from the bottom up. Your goal is to attract a large number of rank-and-ﬁle supporters, so you will not be wholly dependent on your bosses. Adam Smith described self-interest and competition in a market economy as the “invisible hand” that guides the economy. The same is true in your organization. There is good reason people act with self- interest. Their careers provide economic stability, social identities, and purpose. The higher up your organization you go, the fewer people are going to understand what youʼre trying to do. They have too much to lose by changing; they want to maintain the status quo and protect their positions. Sitting under the watchful eye of the corporation, procurement entrepreneurs, will die by a thousand cuts as each department manager explains why your new project is a bad idea. NIH syndrome brings about irrational behaviors and rejection, particularly in a defensive culture towards new ideas. The value added may be underestimated, and its cost overestimated. In many companies, there are potential mentors. People who have respect paid their dues and are above everyday corporate politics. This status and respect provide the attention of top management. Procurement entrepreneurs should ﬁnd a mentor to support their ideas provide advice, guidance, and protection—should it be needed. Formal sponsorship is one of the last steps. A VP or SVP will “own” your idea and support it more if they “discover” it and then approaches you about sponsoring it. So procurement entrepreneurs should try to keep their innovations away from of the daily grind, but retain the connection to corporate resources. In big companies, data can bring detractors, but it might be too late to get the data once the detractors appear. Unfortunately, the very cohesiveness that makes an entrepreneurial group so eﬀective can lead to its downfall. Elitism can take hold among members who believe that only they “know” what to do. They start to develop the very same NIH characteristics they had to overcome in the first place. Consequently, performance starts to decline, as the entrepreneurial group creates its own, new bureaucracy. Like any successful project, once complete it is usually best to dismantle the team and integrate it into the organization. The procurement entrepreneur is ready for the next challenge. The downside of trying to innovate within a big company is clear and well documented, but there are also beneﬁts to doing so. Procurement Entrepreneurs should make full use of the existing infrastructure to make innovation easier—start by stealing, if you have to. If you see a good idea elsewhere and it will work in your organization, copy it. CPO’s are focused on reducing time to market cycles to stay ahead of the competition, and increasingly striving to capture constant innovation and rapid entry into new markets. A key competency to achieve this is scanning external markets for potential technology partners and innovations. Success provides new growth opportunities, early knowledge about attractive partners and helps attain first mover advantage when entering into a strategic alliance. For procurement, it means developing advanced business intelligence and collaboration capabilities to capture innovations that can be used in the organisations own customer value proposition. Through closer integration with sales and marketing to get closer to the end customer, it is possible for procurement to assess external innovation from an end customer perspective and analyse the potential value of the innovation. This intelligence-based approach to innovation helps leaders secure competitive advantage, albeit short term. In this role, procurement innovations come from anticipating, finding and realizing opportunities in the supply market that possess value in the customer market. This concept of temporary competitive advantages is highly significant for all types of business but especially so for those engaged in differentiation and innovation strategies. In order to be competitive in the long term, they must develop the core capabilities that will enable them to forge the chain of short-term competitive advantages. Increasingly, organisations are competing through market disruption strategies and tactical manoeuvring to gain short term competitive advantage, until competitors catch up. Apple’s first mover strategy allows its procurement function to lock up component capacity making it hard for competitors to respond. The Procurement Entrepreneur has many difficulties to overcome. From identifying and securing small innovative suppliers, through to the potential need to provide initial operating capital to get them properly off the ground. This can take procurement into the territory of the venture capitalist. By creating an investment fund to provide seed capital to smaller innovative suppliers, buyers can secure preferential access to capacity and innovation. One of the benefits is often that the smaller business’s creativity and innovativeness complement the larger company’s ability to execute large volumes. When considering investment decision in their supplier, buyers need to be aware of the potential adverse outcomes. For example, their competitors may benefit by ‘piggy-backing, on their investment because of the consequential improvement in the supplier’s performance. Also, if buyers ask for too much in return for their investment, their competitors may be forced to invest also, to offset your newly gained advantage. The setting up of a small high growth business inside a larger mature business is an example of venturing. Richard Branson’s Virgin Group is a classic example of this whilst avoiding moves that risk the base business. In my experience, I have worked with a major logistics organization that launched a customer facing contract hire and fleet management company to provide services to a broader market. Such arrangements support the entrepreneur with managerial and multidiscipline skills and capitalise on the buying power and procurement expertise gained from within the mature business. Innovations come from anticipating, finding and realising opportunities in the supply market that possess value in the customer market. Procurement entrepreneurs capture ideas through market intelligence, working with preferred suppliers through to progressively more obscure suppliers in the ‘open sourcing’ environment. They are the bridge between supplier innovation and the customer. Procurement is no longer reacting to the organizations demand but is instead capturing trends, innovations, and industry events and taking its proposals to the business, which in turn has a reciprocal impact upon business strategy. Procurement’s role in leading organizations is growing beyond cost savings and into the value chain. The value-added of the average company from internal activities has decreased continuously in the last fifteen years due to increased outsourcing of operational tasks. Some already operate with internal value-added as low as 20 percent that may become the norm in future. With the majority of value being captured from external sources, a new level of procurement capability is required, which in turn requires a new breed of a procurement professional. The Procurement Entrepreneur. This entrepreneurial breed of procurement professional isn’t found swimming in the traditional talent pool, so organisations will need to seek new sources of talent or develop suitable candidates from inside their organisations. Leaders have already started. Will your organization be an early adoptor or a laggard? Contact us if you would like to discuss your procurement innovation challenges.